Published under Edward VII’s reign in 1907 by London publisher Chatto & Windus, this book was written by William John Loftie. 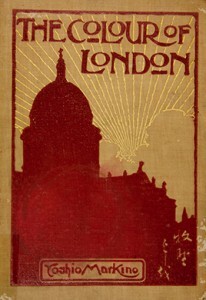 Essays on the geographic history of London together with 26 colour and 12 sepia illustrations compose the book. 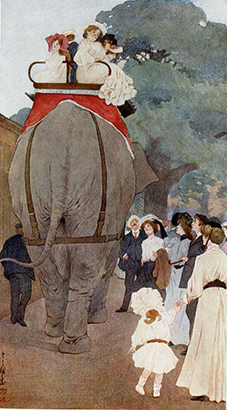 The book appears to have been popular as in 1908, The Colour of Paris: Historic, personal & local was published, followed by The Colour of Rome: Historic, personal & local published in 1909, both with ample illustrations. [Markino] was born on Christmas Day of 1874, a Samurai. His grandfather was the well-known artist Bai Yen. 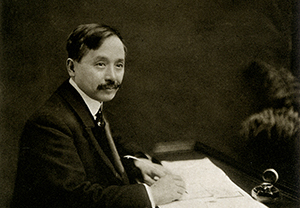 […] Young Yoshio Markino […] went to San Francisco and entered the art school. […] In 1897, he came to London and studied for a time at the night school of the Goldsmith’s Institute and the London Central School. 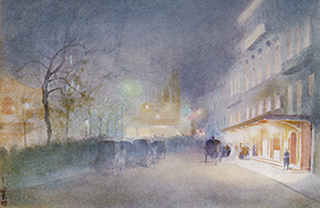 After many years of humble living, Markino’s watercolours depicting emotive and lyrical scenes of London life seen through the misty fog were much admired and catapulted him into London and European elite circles as a celebrity artist. The breakout of World War II and the subsequent deterioration of Anglo-Japanese relationship, however, forced Markino to return to Japan in 1942 after a 46-year sojourn. In Japan he found accommodation at the residence of Shigemitsu Mamoru, a former Japanese Ambassador to the United Kingdom. When the house was destroyed after an air raid, Markino together with the Shigemitsu family temporarily relocated to Nikko and then on to Kamakura. In 1950, Markino left the Shigemitsu family’s home but continued to live in Kamakura until his death on 18 October in 1956 at the age of 86. Sir Hugh Cortazzi, who the readers here may know well as one of the important patrons of the Sainsbury Institute, has researched extensively on a number of themes related to Anglo-Japanese relationships including Markino. As a result, the Lisa Sainsbury Library is privileged to have through Sir Hugh and Lady Cortazzi’s contribution the three above mentioned volumes as well as other books featuring Markino’s work. her as ‘the first foreign student to study abroad in Japan to research such a special theme since the end of the war. Keio University gives a warm hearted welcome and full support for her endeavours to complete her research.’ Her study period was initially agreed as one year, however, she returns to England in November 1953, two years after her arrival to Japan. In Blacker’s diary dated Sunday 5 July 1963 is an account of her meeting Markino at Tôkeiji in Kamakura. She was 27 at the time and Markino was 83. The encounter was much similar to the same incident described in Biographical Portraits. One exception is that in Biographical Portraits, her writing gives the impression that she visited Markino on her own, while in her diary, her encounter according to the entry was through an acquaintance who took her to Tôkeiji and made the introduction to Markino. 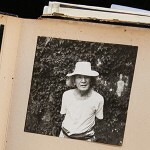 She describes how ‘the old man continued to talk torrentially for three-and-a-half hours, now in English, now in Japanese’ and paints him as ‘an old man in a battered panama hat, […] and long white hair curling down to his shoulders.’ There is an album containing a photo of Markino that matches Blacker’s diary entry. The album containing the photograph Blacker added was originally a gift to Blacker from Keio University newspaper. 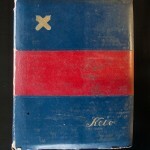 The album cover features Keio University’s signature navy-red-navy stripes and the pair of gold crossed pen nib emblem. Both Carmen Blacker’s diaries and albums are–through the generosity of her husband Michael Loewe–gifted to the Lisa Sainsbury Library in 2009. As the donation is made on the condition that the contents of her diary remain private, I have avoided including the actual entry and personal information found in the diary. * The actual birth year of Markino, according to other references, is 1869. The year 1874 mentioned mentioned inThe Colour of London is erroneous. Blacker, Carmen. Yoshio Markino, 1869-1956. Biographical Portraits: Britain and Japan. Volume 1. Folkestone : Japan Library, 1994. pp. 174-189. Clark, John. Japanese Exchanges in Art 1850s-1930s, with Britain, continental Europe, and the USA, Sydney: Power Publications, 2001, pp. 295-305. Cortazzi, Hugh. Yoshio Markino : a Japanese artist in Edwardian London. Arts of Asia. 39-6, 2009. pp. 96-103. Masuko, Hiroshige. Nihonjin gakō Makino Yoshio : Heiji Rondon nikki. Tōkyō : Tōshindō, 2013. Milward, Peter. Mai fea rondon =My fair London. Tōkyō : Tōkyō Shoseki,1993. Rodner, William S. Edwardian London through Japanese eyes :the art and writings of Yoshio Markino, 1897-1915. Leiden : Brill, 2011. Soseki Museum in London. Yoshio Markino (1869-1956) : paintings, watercolours & letters. London : Soseki Museum in London, 1989. Toyota-shi Bijutsukan. Makino Yoshio =Yoshio Markino. Toyota-shi : Toyota-shi Bijutsukan, 2008. Toyota-shi Kyōdo Shiryōkan. Makino Yoshio, Toshitarō ten : kyōdo no ijin, yoga to nanga no gaka kyōdai. Toyota-shi : Toyota-shi Kyōiku Iinkai, 1984. Toyota-shi Kyōdo Shiryōkan. Makino Yoshio ten :kiri no gaka. Toyota-shi : Toyota-shi, 1990. Tsunematsu, Ikuo. Makino Yoshio : Rondon no Nihonjin gaka = Yoshio Markino : a Japanese artist in London. Kagoshima-shi : London House, 1990.